I guess I forgot to tell you about my little black Lionhead doe. I got her a couple of weeks ago and figured she’d make a nice addition to the farm. She’s jet black and so, so soft! I do need to get her claws cut because she could definitely slice you with those sharp little ginsos! I’m asking around to see if I can find her a buddy – I hate for any of my animals not have companions. 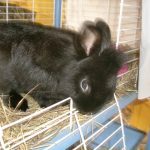 No, I don’t want to start a rabbitry – a little girlfriend will be fine! This little doe was raised in a nice home with children but as it usually is once the novelty of the new pet wears off, mom gets stuck with taking care of it. Funny thing, with the money the little girl got from the sale of her bunny, she wanted a fish! Can’t figure that one out – trading a soft cuddly bunny for a cold fish!